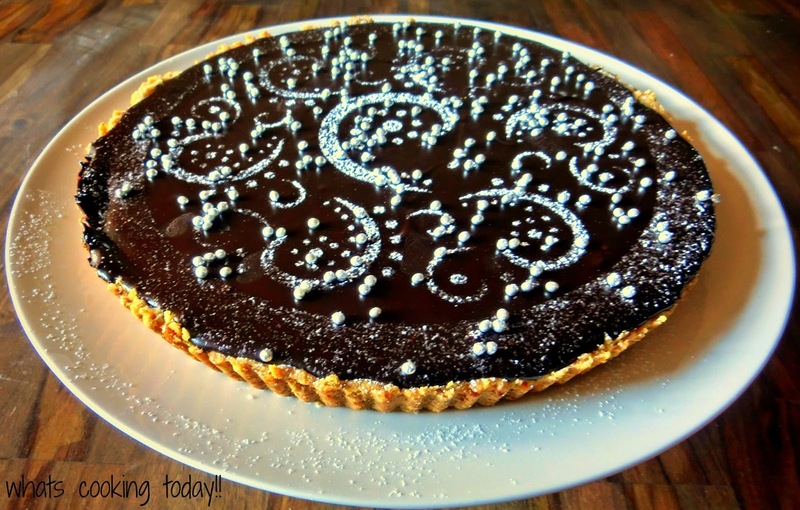 Chocolate Ganache Tart for the Potluck! An egg lightly beaten for the egg wash with 2tsp of water and pinch of salt. Mix the yeast into some warm water with the sugar and keep aside for about 10 minutes. Then into a food processor add the flour. In a slow and steady stream pour in the oil, egg, yeast mixture till it comes together to form a soft dough. If more liquid is required use more warm water to form a soft dough. Once the dough is formed take it out and put it into a well oiled bowl, cling wrap and allow the dough to rise for an hour. In the meantime, the filling can be made. Into a frying pan, add the butter and saute the chopped onion till pink. Add in the ginger garlic paste and saute for about 2 minutes. Then add in the shredded chicken and cook. Tip in the all spice powder, and the black pepper powder and saute. Once the chicken is cooked, add the flour and cook for another minute and keep aside. Check on the dough and once risen, punch it down divide the dough into 2 balls or more depending on how big you want the loaves. Roll the dough into a rectangle Spread half the chicken filling down the center section, leaving 1" free on all sides of the filling. Preheat the oven to 180C. Brush the loaves with egg wash (one lightly beaten egg, 2 teaspoons water and a pinch of salt), and sprinkle with coarse sparkling sugar, if desired. Bake for 25 to 30 minutes, or until the loaves are golden brown. 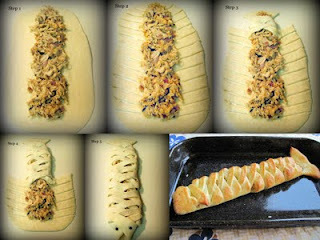 Remove from the oven and cool for 15 to 20 minutes before serving. Tip: You can use the following below image to make your braid. This is from My Culinary Adventures. As a part of the Republic Day Dhamaka that was celebrated, this was the second flavor of cupcakes that I made - Banana Cupcakes with a toffee layer with Chocolate hearts. These were made for the slightly healthy conscious who didn't mind indulging in a little bit of a sweet tooth!! Preheat oven to 180 degrees C and place the oven rack in the middle of the oven. Line a 12 cup bun pan with paper liners or butter or spray with a non stick spray. Place the nuts on a baking sheet and bake for about 8 to 10 minutes or until lightly toasted. Let cool and then chop coarsely. In a large bowl combine the flour, sugar, baking powder, baking soda, salt, cinnamon, and nuts. In a medium-sized bowl combine the mashed bananas, eggs, melted butter, and vanilla. With a rubber spatula or wooden spoon, lightly fold the wet ingredients (banana mixture) into the dry ingredients just until combined and the batter is thick and chunky. The important thing is not to over mix the batter. You do not want it smooth. Over mixing the batter will yield tough, rubbery bread. Spoon the batter into the prepared muffin tins. Bake about 20 - 25 minutes or until a toothpick inserted in the center comes out clean. Place on a wire rack to cool for five minutes and then remove cupcakes from pan. These make a delicious garnish for your cupcakes. Trace the inside of a 2-inch heart-shaped cookie cutter onto parchment 30 times using a pencil. Flip parchment, and transfer to a baking sheet. 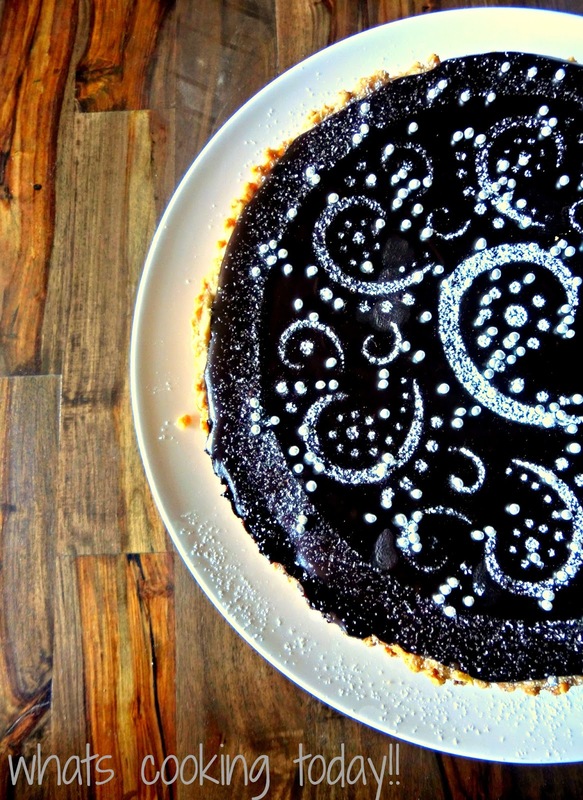 Melt 4 ounces chopped bittersweet chocolate in a double boiler or heatproof bowl set over a pan of simmering water. Let cool slightly. Transfer to a parchment cone (or resealable plastic bag). Snip a tip to make a small hole. Pipe chocolate into hearts, following outlines (be sure squiggles are at least 1/4 inch thick so hearts won't break when removed). Freeze hearts until set, about 15 minutes. Remove hearts using an offset spatula. You would get about 30 hearts. Once the cupcakes are cool. Smooth a teaspoon of the dulche le leche over the surface of each cake, but don't worry about completely covering it, then decorate with a chocolate heart in the center. The cupcakes are best eaten the day they are baked, they stay upto 3 days in an airtight container. My day began with the Monday blues and to hit the blue show on the road, I went to Trader Vic's Mai Tai Lounge to review their latest Menu additions. 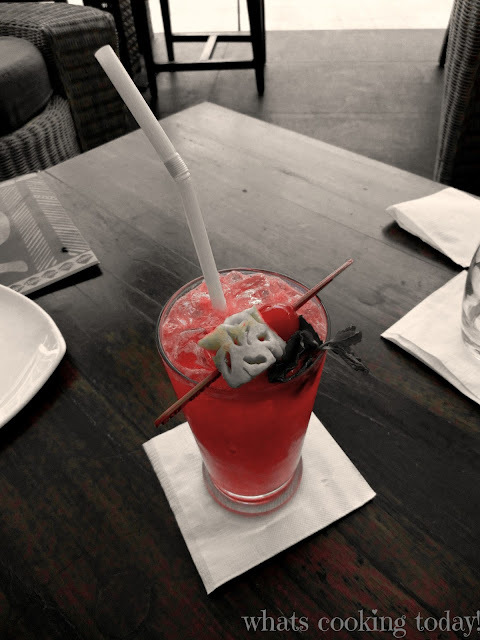 Mai Tai is a fine place to dine, its a perfect getaway during the weekdays and more so on the weekends. Located by the lake at Bangalore's newest lifestyle mall -The Brigade Orion Mall, Mai Tai sets itself apart from other lounges in the city. So for my Monday afternoon, this was the just the place I needed to be. The menu hosts some interesting dishes 'From the Wok' such as the Mango Chili Tenderloin, Sweet and Sour Chicken, Kung Pao Chicken, Bbq Vegetables and Tofu, Thai Red and Green Curries, Noodles and Fried Rice. The other new section which is New is 'From the Grill' and I chose the grill over the wok, my decision was bound. The menu has been expanded on requests made by loyal customers, is what I was told on my little chit chat with Mr. Priyank Chouhan the Area Manager for South India and Mr. Gautam Yadav the General Manager for Mai Tai Lounge. Mr. Priyank mentioned "that when customers go through the menu they look for something they are used to, thus there was a need created to expand and do a little tweaking so that we give what customers look for". My de'jeuner started off with an absolutely refreshing drink the Queen Charlotte Fruit Punch, a luscious fruit drink, highly recommended for non-alcoholic drinkers for an afternoon for the rush of the fruit and the fizz that's in it. Along with my drink I was served the appetizers such as the Huli Huli Chicken, a Hawaiian preparation of succulent morsels of chicken with a tangy flavor skewered and grilled to perfection. You'd get a sweet, tangy and a slightly spicy note at the end of it along with crunch note from the grilled green pepper which just makes it even more desirable by the bite. Next up was the Cilantro and Scallion Prawns which was tinged with the charcoal taste, the prawns were moist with the right amount of cilantro and scallions paste coming through and served alongside a wasabi mayo dip. I rate this dish as mediocre especially because my mind was biased on the chicken I tasted. Another memorable appetizer was the Island Corn Cakes, again bite sized corn cakes served on a piece of buttered toast. The corn cakes are creamy with the sweetness of the corn kernels against the much need crunch of the toast. Another appetizer were you couldn't stop at one!. For the mains, by far the best I have had was the Senor Pico Chicken which was a boneless piece of chicken served with some good mashed potatoes on a fiery pepper coulis with a corn salsa. All in all I'd give the dish a 10/10. The condiments were just right on the plate against a good portion of the chicken. And to end my lunch affair, I had the Coffee Creme Brulee, the flavor was bang on, but would have loved a bit more crack to the sugar. But seriously, it really didn't matter,the bitterness of the sugar and the coffee creaminess beneath, and being the coffee lover that I am, anything with coffee is fine by me. And that ended my afternoon by the poolside at Mai Tai, but I'll be back for more especially to check out more 'From the Grill'.